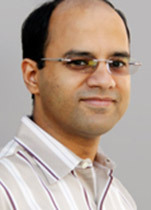 Dr. Balasubramanian specializes in robotics and human control systems and has two primary research goals: (1) to make robots operate robustly in unstructured environments such as the outdoors and built environments not specifically designed to accommodate robotic operations; and (2) to develop a deeper understanding of the neural control and biomechanics in the human body. His approach involves a tight integration of fundamental control and design techniques as well as human-subject experiments to study human performance. Application areas include robotic grasping and manipulation, mobile robotics, human-robot interaction, and rehabilitation.